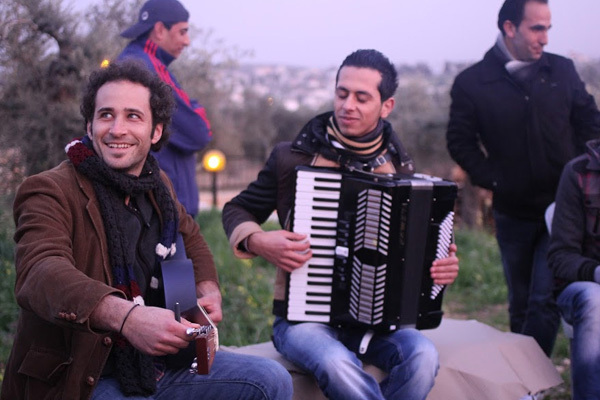 Join the Joshua Davis Band on Saturday night at Wealthy Theatre at 7 p.m. for a documentary screening AND a night of live music, based on Davis' journey to the Palestinian West Bank in 2012. The People and The Olive - Trailer from Stone Hut Studios on Vimeo. Joshua Davis is a husband, father, friend and music lover. He shares songs for a living- as a songwriter, record producer, band member, solo act, guitar/songwriting teacher and mix-tape-maker extraordinaire, all with the most amazing people on the planet! Davis was raised on American roots tradition: the music, the social movements and the land. He writes original songs that blend many folk traditions, including gritty rock n' roll and vintage soul. 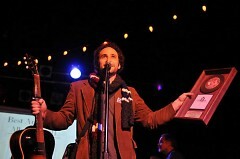 Performing Songwriter Magazine called the result, "Some of the liveliest and most rocking roots music around." Davis has shared his songs, knowledge, interests and know-how across the US at festivals, theaters, concert halls, coffeehouses, schools, parks and dive bars. He has released albums under his own name, with roots ensemble "Steppin’ In It," classic swing band "Shout Sister Shout," and has appeared on many more. Davis is especially interested in the ways in which music brings individuals and communities together, to foster peace and understanding. He's noticed that songs can re-soundtrack people's lives and peoples' lives too. In February, he travelled to Palestine and Israel with nonprofit organization On the Ground to participate as "cultural emissary" in the Run Across Palestine, a fundraising ultra-marathon in support of fair trade farming communities in the West Bank. 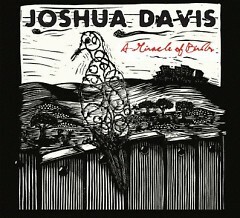 This winter, Davis is releasing "A Miracle of Birds," an album inspired by his experience in the Holy Land. Half of the proceeds will mean olive trees and educational scholarships for the farmers and families he encountered during his travels. The songs are deeply personal and deal with his struggle between his Jewish identity and the oppression and confusion he found in the Middle East. Davis is developing a program to bring to schools and communities that combines his music and stories about the trip as well as club dates with a six-piece band. Davis lives in Lansing, Mich. with his brilliant and beautiful wife and daughter. 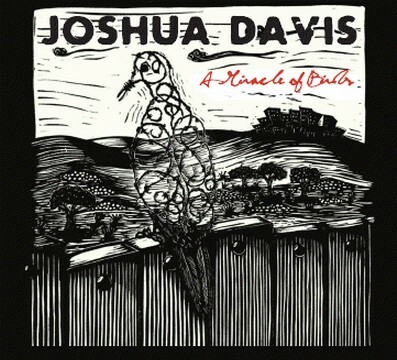 On Saturday night at Wealthy Theatre, WYCE artists "The Joshua Davis Band" will debut Davis' new CD based largely on Davis' experience in the Palestinian West Bank. "The People & the Olive," is described as an inspiring documentary about the daily joys and struggles of Palestinian fair trade farmers and the American ultra-marathoners who ran across the West Bank planting olive trees and bridging cultures along the way. After the 70-minute documentary screening of "The People & The Olive" starting at 7:00 p.m., the Joshua David Band will take the stage and perform live. 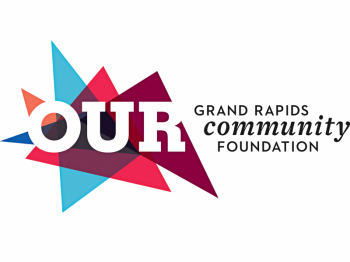 Davis' album features the artwork of Grand Rapids artist Alynn Guerra, who also visited the Palestinian West Bank on another occasion and has created her own series of carvings based on her visit. Davis' journey to the West Bank began when he joined nonprofit organization "On the Ground for the Run Across Palestine," which hosts a five day, 129 mile ultra-marathon to raise funds and awareness in support of fair trade olive farming communities in the Palestinian West Bank. Runners plant olive saplings and build friendships across a land that Davis says was at different times barren and lush, chaotic and serene, idyllic and war-torn. "I was trusted with the honor of carrying some of Michigan in song and story to Palestine, and in return to soak up some of the art and culture there to share with my community," Davis says. "The fear and courage I witnessed there, on both sides of the wall, and also within myself, were profound. I returned much less resolved and far more inspired than I could have imagined." Davis says he was shaken by the hardship and conflict that he witnessed, but inspired by the strength and spirit of the runners, by the courage of the Palestinian farmers and by the Israelis and internationals who are committed to nonviolent resistance "in the face of such oppression and fear." "[The run] helped me to stow away some of my biases and partialities," says Davis, "to examine that grey space between the black and white, and to question my absolutes." Davis is a Jewish-American citizen. "In Israeli-controlled Palestine," he says, "I grappled every day with a barrage of conflicting emotions. I traveled shouldered with the fears and concerns of my Jewish family and friends over my safety and for our history and future as a people." Davis explained that compassion and justice are core values of his Jewish heritage. "I was disheartened by the ways I saw those values being ignored," he said. Davis said he returned with more questions than answers, but "the songs that came after are straight from the heart." Please click here for advance tickets if you'd like to witness Davis' expressions of his experiences in the West Bank, colored by his own unique history and upbringing. "Shalom, salaam - Peace," Davis said.